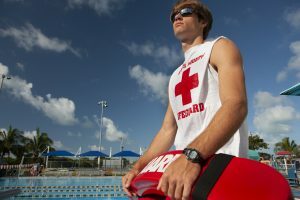 Learn how to respond to water emergencies with the American Red Cross lifeguard training. Our classes will help you with the skills and knowledge to prepare you for a variety of scenarios in and around the water. Students must be at least 15 years of age. Call or stop by the pool to sign up for classes. For more information call 305-453-SWIM. Or contact us by e-mail.